ATEN will exhibit at the 2017 NAB Show, April 24-27 at booth SU9802CM in the Connected|Media IP area, showcasing its 16x16 Modular Matrix Switch (VM1600) and IP-based DVI KVM Extenders (KE6900 series). ATEN will demonstrate how its pro AV solutions deliver precise video streaming without delays for the broadcasting and media environment. The ATEN VM1600 Modular Matrix Switch is an all-in-one solution that offers real-time control and access to manage up to 16 video sources and 16 displays simultaneously. 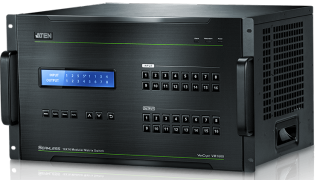 Empowered by Seamless Switch technology, the VM1600 incorporates a speed-progressive video switching function and unique scaler, integrating with video wall systems to broadcast live programs across multiple screens with precision in any dimension on a perfect timeline. In addition, the installation is fully expandable with modular I/O boards that are hot pluggable for quick replacement of AV connections without shutting down any existing service. ATEN’s KVM-Over-IP solution will also be highlighted to show how KVM matrices function in control rooms and create workspace flexibility by providing instant access to various servers and video sources. The KE6900 is an IP-based DVI KVM Extender designed to deliver flexibility for extending, sharing, and controlling multiple computers from any location on a network. With its video wall function, shared access modes, and advanced security options, the solution is fitting for broadcasting and traffic control rooms. As part of the show’s full seminar program, ATEN product manager Alan Sarutanond will present the session, “Making the Switch: 4K and the Future of KVM Over IP” in the Connected media|IP Pavilion on Wednesday, April 26 from 3:30-4:00 p.m. This session will cover the latest innovations in desktop KVM switching technology and the benefits of delivering content in 4K.